New Navy back with a brand new single just in time for the Australian Summer. 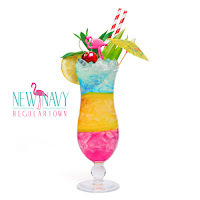 "Regular Town" has that typical lush and uplifting New Navy tone to it. Signature jangly guitars and perfect vocal accompaniment makes this track well suited for one of those hot summer days, just take a look at the cover art. They're another major Aussie act to follow next year just like San Cisco, and with this single, they're definitely on the right track.